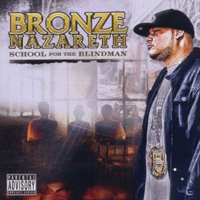 Please check out my new review of Bronze Nazareth's School for the Blindman album that's just been published in Slant Magazine. For five years that record was the most anticipated thing on my whole radar and now that it's finally here, it doesn't disappoint. For those interested, the Slant review is basically a preview for a much more thorough song-by-song review that will be coming soon. I've had a hectic but very fun and exciting last couple of weeks and I'm still trying to get through a bunch of writing projects. Many more things will be appearing on the blog now that I've got some time as well. Look for a couple more new hip hop album reviews in that song-by-song, enormous breakdown style, should have them up here by the end of today. Bronze's brother and fellow member of the Wisemen, Kevlaar 7, also just released a new mixtape that's free. It is entitled Redux on the Boards and features 10 tracks from artists like Jay-Z, Nas, Outkast, Ghostface, and others, all remixed over Kevlaar 7 beats. Plenty of heavy bass drums and creative sample chops, as is K7's specialty. If you enjoy quality hip hop music at all, definitely go check that out. You can preview and download it here. Last Tuesday, I actually go to attend a Snoop Dogg concert here in Austin. Although I was a fan of his (and Dr. Dre's) music years ago, I haven't really listened to their material in a long time and really didn't know what to expect as over the years I had begun to associate Snoop in my mind with movies and parodies instead of actual rap music. Walking into the venue, the outdoors atmosphere and college student-populated crowd kept bringing to mind the hilarity of Snoop's house party appearance in the movie Old School (when he was interrupted by a naked Will Ferrell bursting onto the stage). The show was outstanding, though. Tracks from The Chronic 2001 brought back memories of when that classic was first released and the whole venue bounced in unison to the smashing drums and booming bass. Snoop is a helluva master of ceremony, he kept the crowd into it for a set that lasted almost 2 hours, bringing tons of wit and humor into the mix in between songs. It was a really great time overall, one of the more memorable concert experiences I'll ever have, I'm sure. Even got to go backstage and meet some of the artists, including Kurupt prior to the show when he'd just awoken from a long nap on the tour bus, and ended the night consuming late-night grub with the opening acts at a pizzeria across the street. Much thanks due to Matt "M-Eighty" Markoff for bringing me along and introducing me to everybody.